Chances are high that at some point in your university years you will rent an accommodation. Chances are even higher that you will need to sign some sort of document detailing your rights and responsibilities as a tenant. In general these documents are called leases or rental agreements. Most leases or rental agreements are documents that define an assured shorthold tenancy, the default type of letting arrangement in most of the UK. Details of any type of letting or tenancy documents should be read over carefully and checked by professionals if desired, so don’t be afraid to delay signing anything until you are comfortable with all of the terms and conditions involved. A rental agreement is very often a phrase used to cover any agreement between a landlord and renter. Sometimes these agreements may be as informal as a spoken agreement for a weekly or monthly rental fee, but they can also be written documents that cover a particular tenancy. For more information on common types of rental agreements in your area, get in touch with local authorities or private estate agents well versed in student housing. A lease is basically a long-term rental agreement. Leases generally run from 6 to 12 months and do not automatically roll over at the end of this period. Rather, the renter must give written notification that they would like to extend the lease for another period of time. During the 6 or 12 months of the lease, the rent price can not change and the conditions of the lease cannot change unless the renter agrees. What are Appropriate Terms and Conditions in a Rental Agreement or Lease? 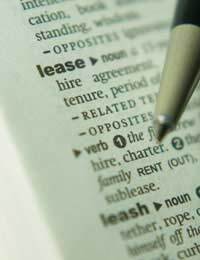 Why are Leases and Rental Agreements Necessary? Leases and rental agreements are simply the documents that lay out the terms and conditions of any letting transaction. The rights and responsibilities of both the renters and the landlord are detailed in these documents. Landlords and tenants will each sign an identical copy of these documents, and each party involved should keep their copy for future use. For the most part, leases and rental agreements will detail the assured shorthold tenancy of the letting. This type of tenancy basically assures the landlord that they can have their property back at the end of a tenancy as long as the tenancy as has lasted for at least 6 months. It also usually assures the tenant that even if they have agreed to a rent with the landlord, they can refer this figure to a rent assessment committee if desired. For all new tenancies, renters can expect the landlord to provide them with a document stating that their letting is an assured shorthold letting. Most rental agreements and leases are simply documents stating the rights and responsibilities of both the landlord and the tenant. They exist to protect both parties so that in the event of a discrepancy, a mediator or judge can see exactly what was agreed to before the tenancy began. Rental agreements and leases also offer protection to both the tenant and the rental property in that with such official documents, the property may be officially registered as a rental property and thus must be brought up to all health and safety as well as good practice codes. It is in your best interest as a tenant to sign an acceptable rental agreement or lease, just as long as you understand all of the terms and conditions. If not, do not sign anything until you enlist professional help. Good luck!